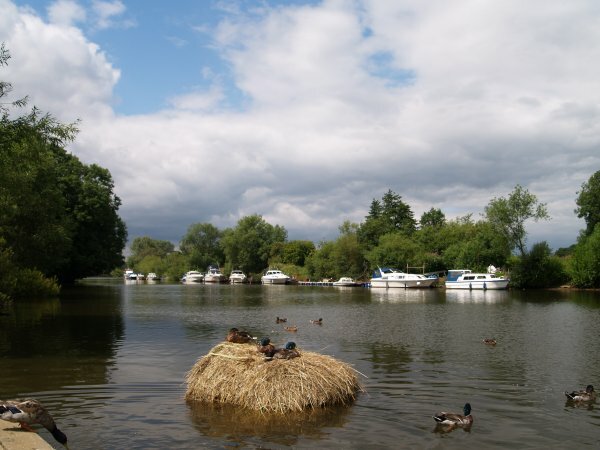 The River Ouse at Naburn packed with many river craft and breeding mallard ducks! 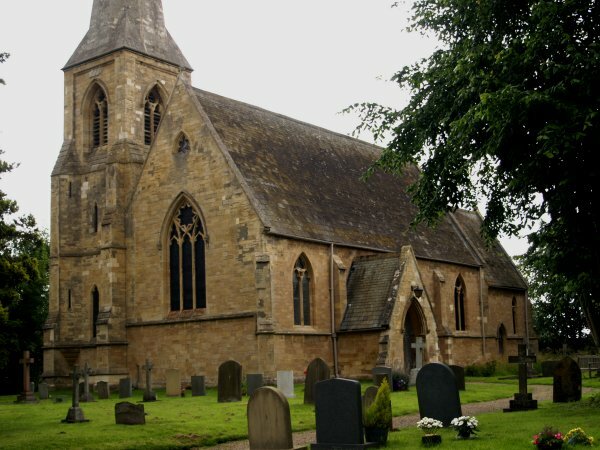 St Matthew's Church, Naburn, built in 1854 to an early 14th century style design of G. T. Andrews. The north-west tower has broach-spire. Nice warm honey coloured limestone or sandstone? 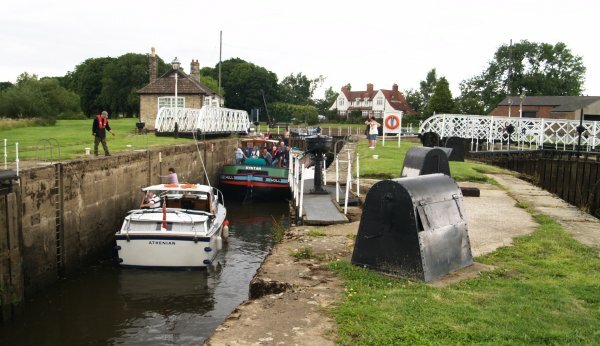 The Naburn Lock at the southern entrance/exit to the great River Ouse. 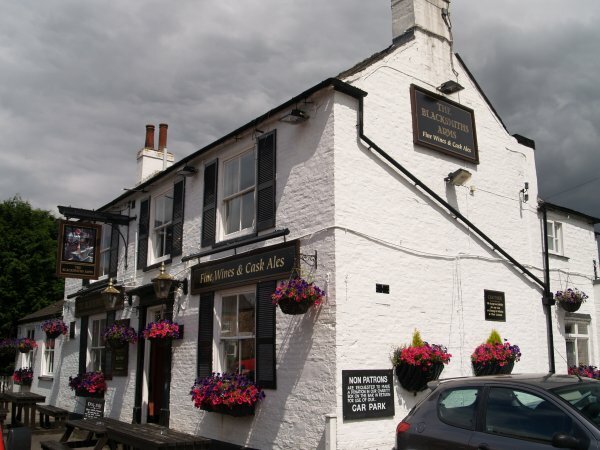 A weir was built in 1741 to provide water for a mill and the first lock was opened in 1757. 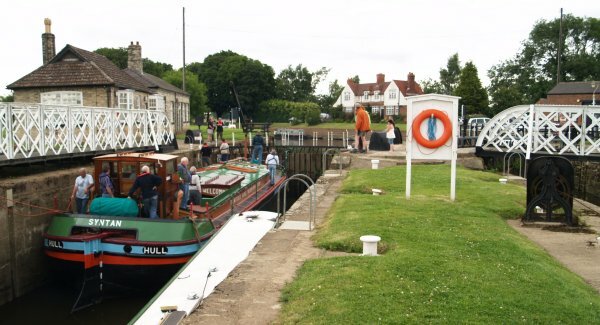 A new bigger lock was built alongside it in 1888. You can see both locks in the picture below. It seems to be busy all the time! 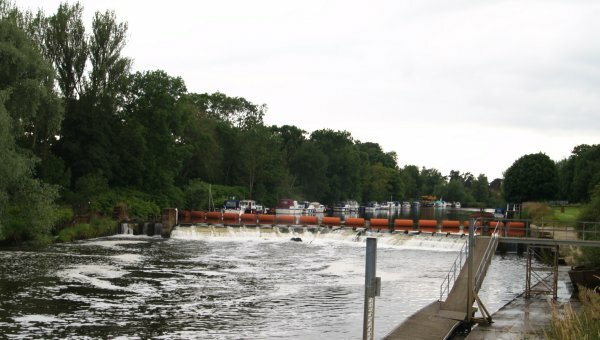 The Naburn Lock bypasses the weir shown above. 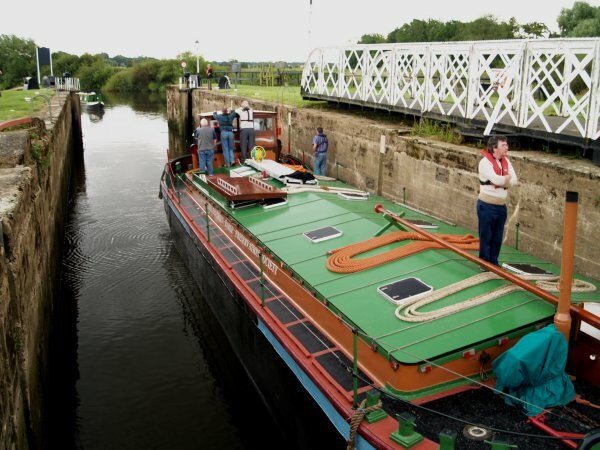 The barge called SYNTAN, registered at Hull, has been restored and is maintained by THE BEVERLEY BARGE PRESERVATION SOCIETY. Looking north up the River Ouse on the left and the entrance to Naburn Lock on the right. The quiet village of Stillingfleet is a few miles south of Naburn village. 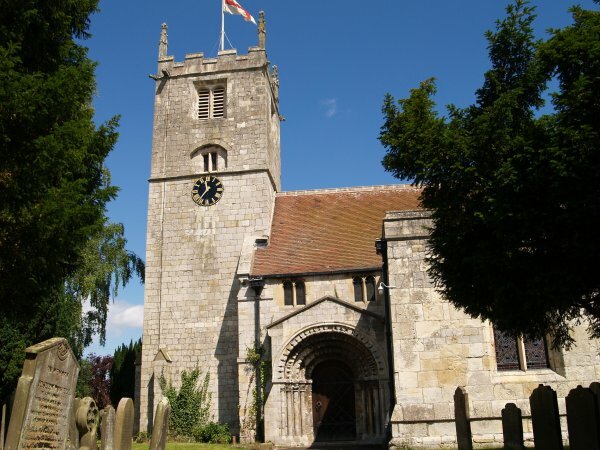 The Parish Church of St. Helen, Stillingfleet dates back to mid-12th century, probably built by Robert de Stuteville around 1154. 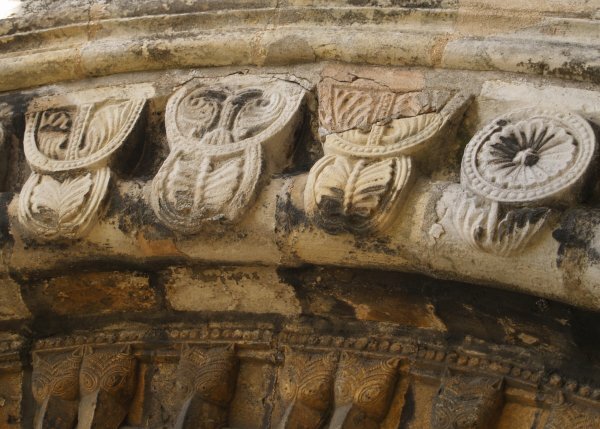 It displays all the styles of medieval English architecture. 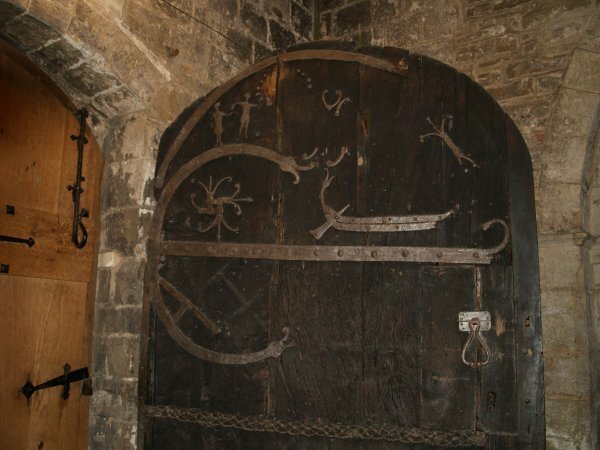 PLEASE LEAVE A DONATION to help in the upkeep of this dignified medieval church with its wonderful oak door and ironwork - now preserved inside for its own sake! 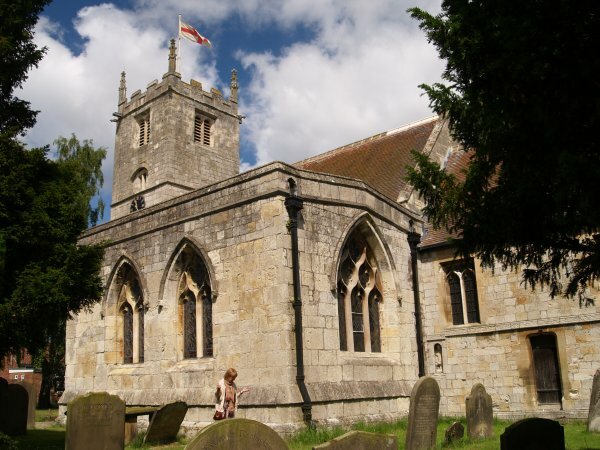 The lower part of the tower is 13th century and the top part added in the 15th century. 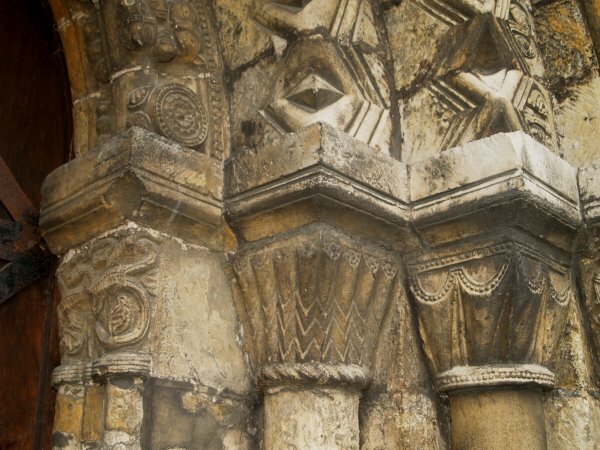 Some nice odd bits of stone carving built into the exterior walls - no doubt from past restoration work. 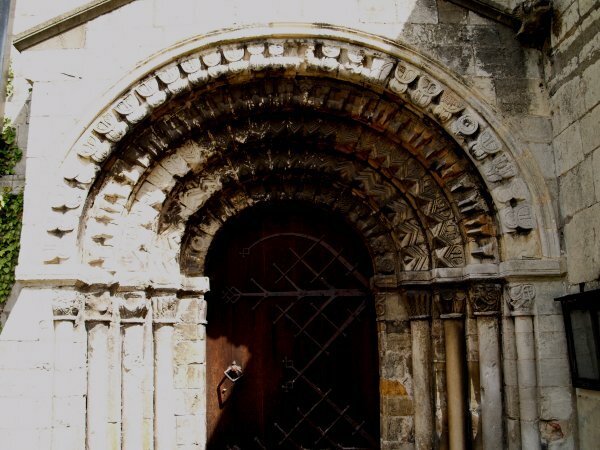 The impressive mid-12th century Norman south door (~1160) with its multi-layers of intricate stone carving - pictures of the details are presented below. 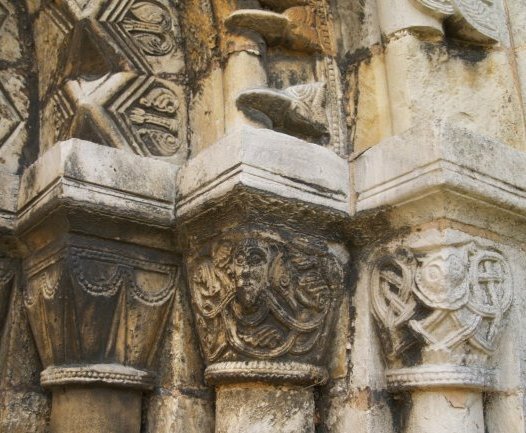 This, not surprisingly, famous doorway is carved with five orders with colonettes carrying capitals with trails, heads, dragons and variations on the scallop and is in a remarkably preserved state. 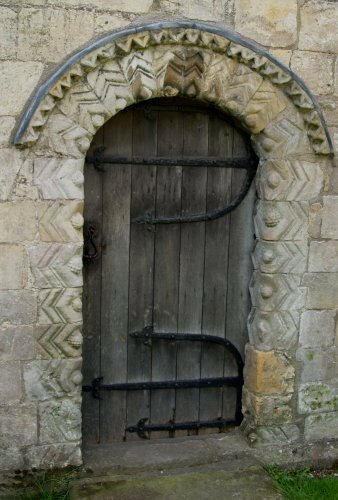 The contemporary door and sympathetic ironwork replaces the historic oak door which is now preserved directly behind it (see further down). 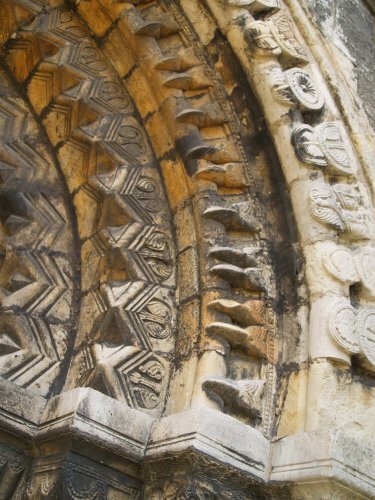 You enter the church by the small Norman west doorway with its classical ornate dog-tooth (zig-zag) markings. 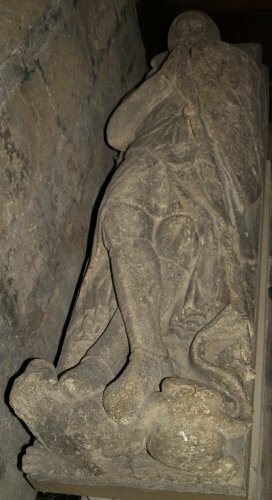 In the 14th century Moreby Chapel (founded in 1336 by Nicholas Moreby) in the south aisle door lies the statue of a knight of the Moreby family in armour with his feet resting on a dog, Sir Nicholas Moreby himself? or Sir Robert Moreby ~1337? 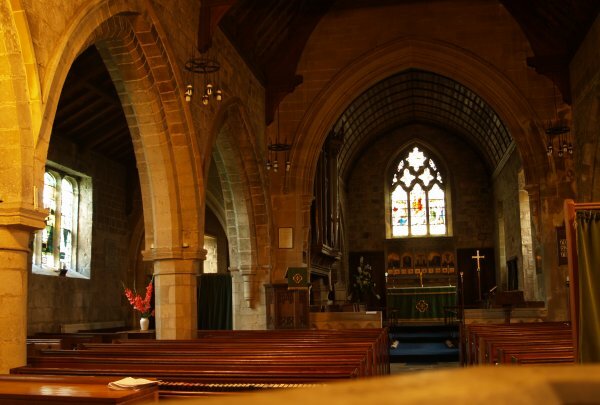 Looking east down the nave to the chancel and altar, on the left two 14th century arches. 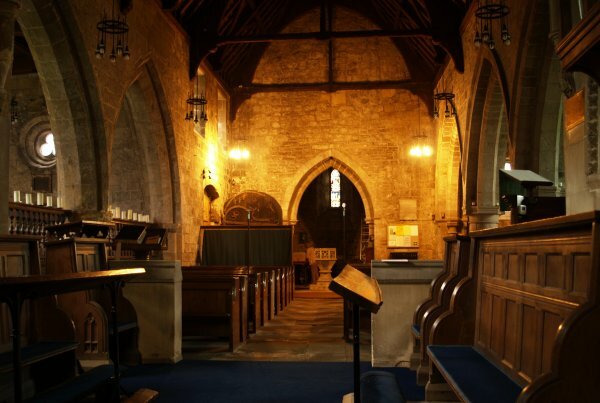 Looking west down the nave to the entrance to the base of the tower. 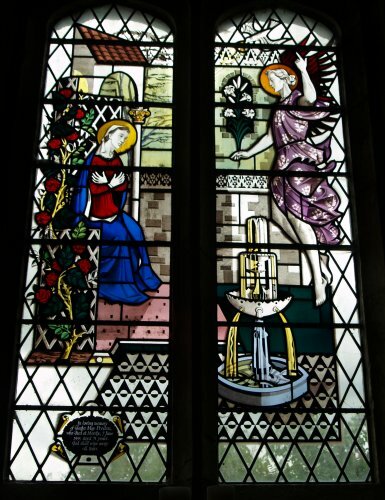 Some of the modern stained glass windows but still contained in the medieval tracery of the stonework of the medieval windows. 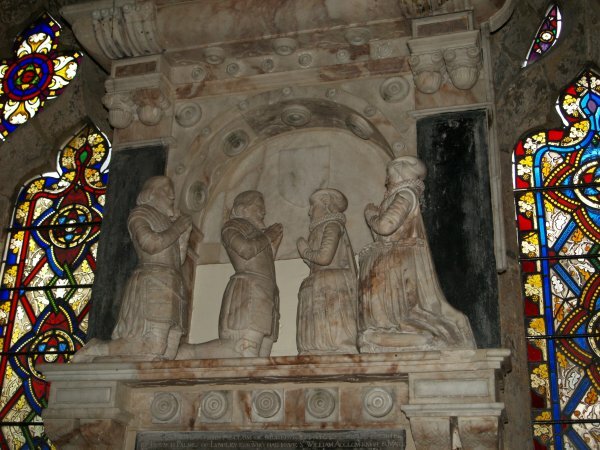 The 1611 alabaster monument to Sir John Acclom and his wife sits rather nicely between two of the stained glass windows (a more detailed picture below). 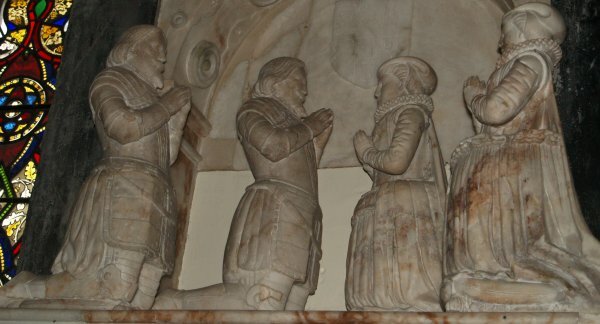 Details of the Acclom monument. 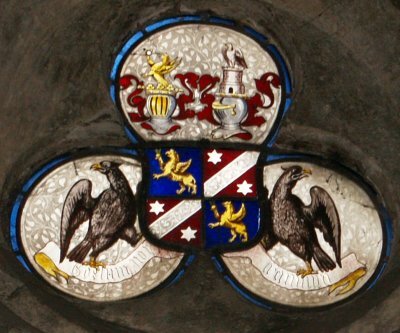 Some of the heraldic stained glass of 1520 renewed by Henry Giles in 1698. 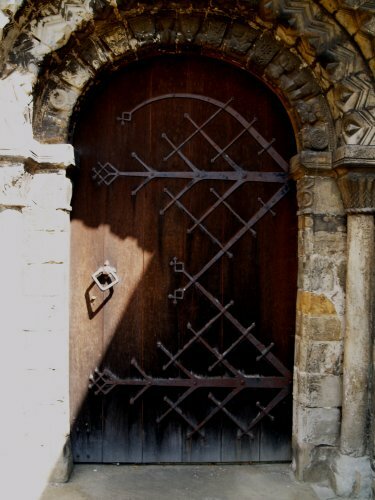 The great south-west oak door and its ancient ironwork, possibly as early as the 10th century and re-used by the church in the 11th or 12th century? 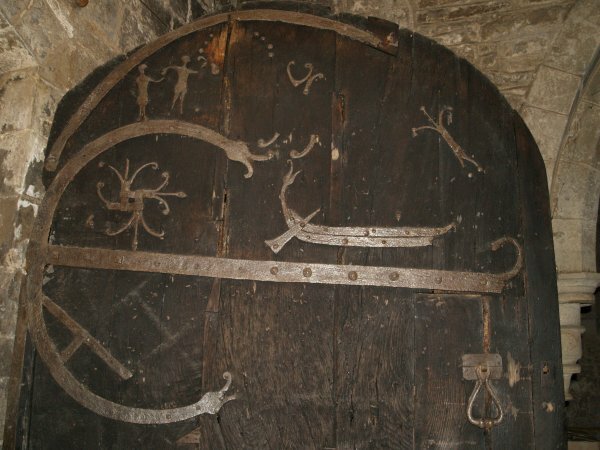 (The doorway itself is dated ~1160) The original ironwork includes almost complete hinges, and pictures showing an interlocked cross, a ship (Viking looking? 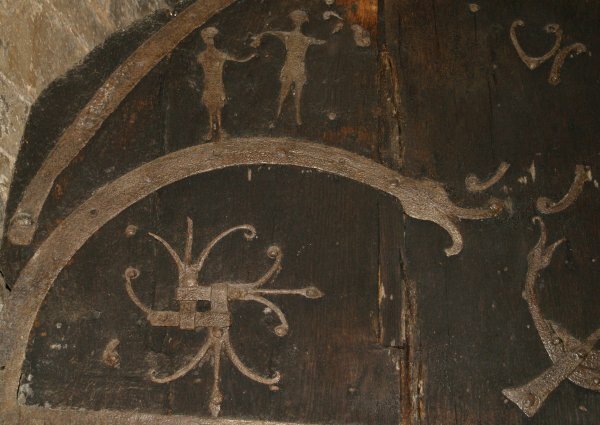 ), a pair of figures, a tree, a horned figure (a shaman?) and another single figure. 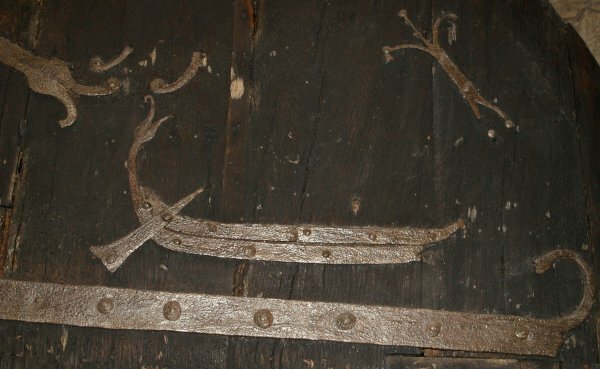 Other intricate ironwork includes the serpent like hinge spas and braiding across the width of the door. All of these features are illustrated in more detail below. 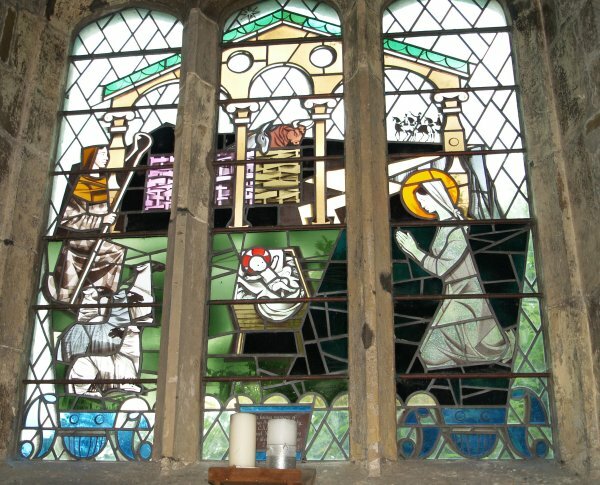 Absolutely fantastic ironwork after 800 plus years, and look how quickly are cars rust away in comparison! 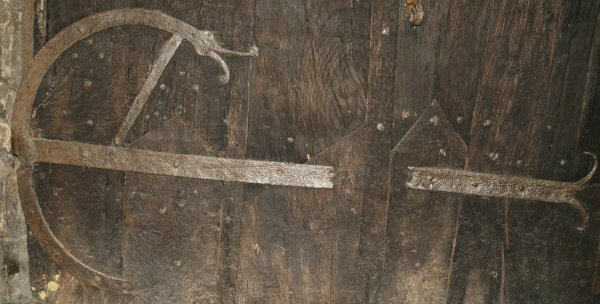 and how much we should admire the craft of Viking or Norman blacksmiths work forging the iron in their workshops with no thought of future admirers! 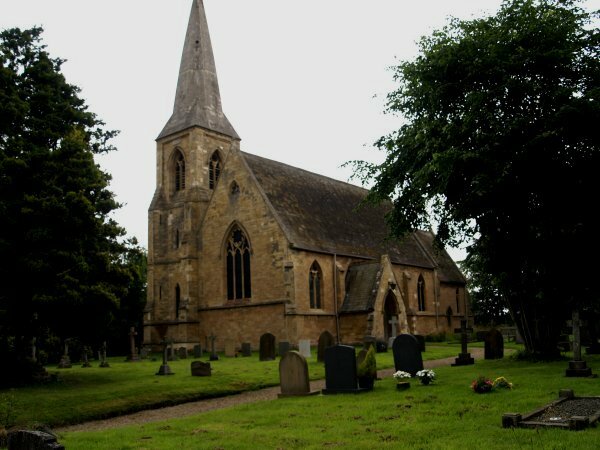 The Parish Church of St. Helen, Stillingfleet is well worth a visit, it may lie on a minor B road but its a class A place of interest!